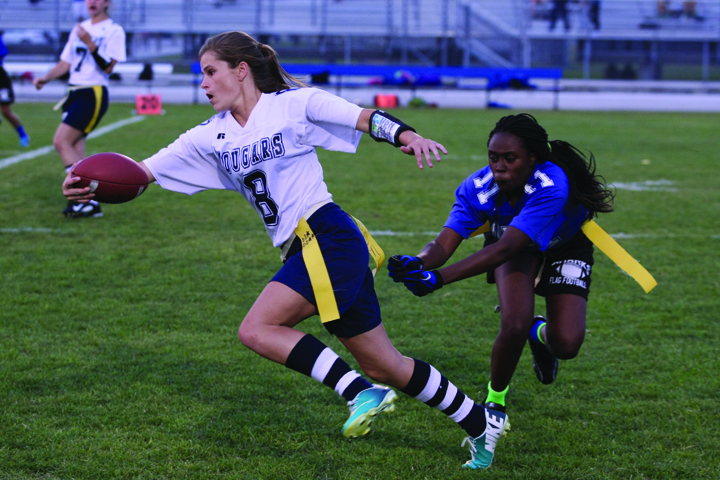 The 2014 spring flag football season has once again proved to merit the attention of fans throughout the county, lining up a number of much-improved as well as experienced championship-bound teams that are eying the title during the upcoming district showdown. Thanks to the current year’s district realignment, the Cougars girls varsity team, led by program head coach Brad Brunson, found itself at the right place at the right time for a chance to finally finish the season with a district title. “This is a great transition year for us,” Brunson said as he talked about the 14-member varsity team, half of which he said are brand new to the sport, never having played before. Ready to face off its new district rivals, East Bay and Bloomingdale, Durant has maintained its successful run of its undefeated season, well aware of the fact that the games that really count are yet to be played. Prior to joining their current district lineup, the Cougars repeatedly played and lost the championship to their former district rival, Plant City. The Raiders were able to maintain a strong stand year after year, and at the same time help raise awareness of the now popular sport. With a solid team the Cougars are eager to give their best in order to reach their goal. While as a team everyone counts, the Cougars especially enjoy the talents of wide receivers Ashley Piechowiak and Kayla Collins as well as four-year starter, senior quarterback Jessica McClernan, who is actually committed to South Eastern University on a soccer scholarship. As a team leader, McClernan continues to demonstrate talent and love of the game she enjoys, including her team’s recent 26-0 win against Riverview, where she finished with 195 yards passing and three touchdowns. On defense, McClernan had two interceptions during the game, one of which was returned 40 yards for a touchdown. Summing up his team’s quest for great season, Brunson emphasized what really makes the program truly successful. This year’s District 13 Tournament is scheduled to be hosted by Bloomingdale High School staring on Monday, April 28, at 6 p.m, and Wednesday, April 30, at 7 p.m.
For more information, visit www.durant.mysdhc.org.